A long awaited release by a Tokyo based authentic hard rock act features a new singer, Ray. Former singer Manabu Takaya was one of my favirite hard rock singer. 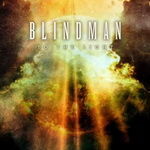 When I heard the news that he left BLINDMAN in 2014, I couldn't quite imagine how this band would sound like without him. Watching their live performance featuring Ray in 2015, I felt like somethig was missing while the sound was nothing but BLINDMAN. The second time I saw Ray on stage in 2016, however, I just figured that he has become a part of the band. All songs on this album are all solid, energetic and emotional. There is no filler. I think Tatsuya Nakamura's guitar play and Hiroki Matsui's keybords provides the best combination of melody and power. Among others, track 3 "Sleepless Night" is a killer - fast, aggressive and melodic. Slow and emotional "Angels Cry", track 5, makes the power surge up within me. I now strongly believe that the band has entered a new stage of its carrier with this album.